The mc.mixdown~ object can find many uses within a single patch. 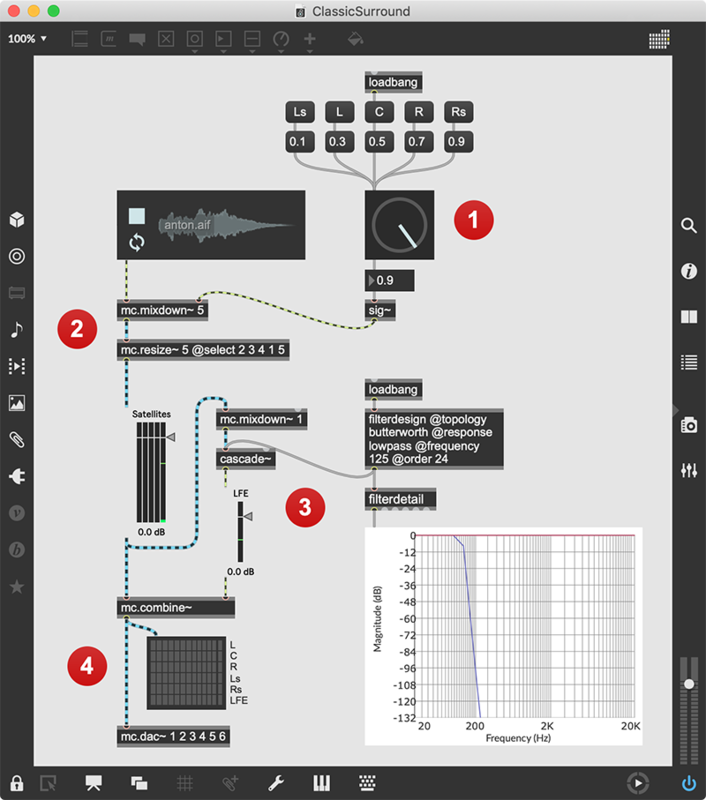 In this recipe, we use this object to generate panning for incoming audio across five channels, and to create a single-channel mix that can be filtered for LFE (Low Frequency Effects) separation. We also perform a little MC manipulation to conform the output into the standard output configuration of a 5.1 surround output. mc.resize~ : a tool for resizing and rearranging MC signals. mc.combine~ : an object for creating a combined-channel MC signal. The dial UI object is set to circular mode (in the Inspector) and outputs values between 0. and 1. - the panning range that mc.mixdown~ understands when used in panning mode 0 (the default). For this case - panning a single file in 5-channel space - we use a standard audio signal input for both audio and panning information. Once the audio is panned into position, we use mc.resize~ (and its select attribute) to move the channels into L-C-R-Ls-Rs positioning. In order to generate an LFE (.1) signal, we mix all of the channels into a single output signal, and run that through a cascade~ object managed by a filterdesign object. In order to create the 5.1 output, mc.combine~ is used to glue the sixth channel to the five full-frequency channels.